Ernest H. “Doc” Ferris was the great-great-great-great-great-great-grandson of Jeffrey Ferris. Born the youngest child of a farming family in the Cincinnati region, he soon saw that farm living was NOT the life for him. Instead, America’s sport, baseball, drew him from behind the plow. He played for a number of teams before and after World War I, and managed as well. Most of his playing time was in the Carolinas and Maryland, in class C or D leagues such as the North Carolina State League and the Piedmont League. 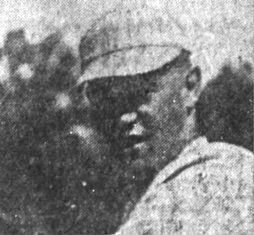 In 1916, Doc Ferris may have set the minor league record for the shortest game and the fewest balls pitched in a game. His Columbia Comers beat the Albany Babies on July 18 in South Atlantic League play. The game took 78 minutes and he threw a total of 73 pitches. 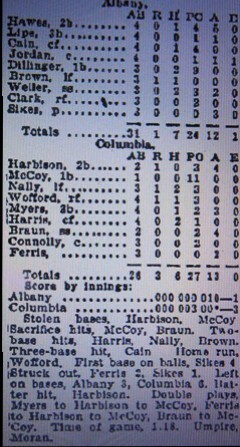 Fielding was the savior for the Columbia team with Ferris recording just two strikeouts. Ferris went on to several business enterprises and was a real estate broker in Greensboro, NC, for a long time. He married in and had two daughters. Ernest Hayes Ferris, Sr. Had 3 sons and 1 daughter.